A key issue in Personal Audio, LLC v. CBS Corporation, 2014 WL 1202698 (E.D. Tex. 2014) was whether a LinkedIn page, printed off the ‘Net by a testifying witness, was admissible at a motion to transfer venue hearing as a “compilation” or “directory” under Federal Evidence Rule 803(17). A broadcast behemoth defendant (CBS) tried to transfer a podcast patent infringement case from Texas to New York on the basis that material witnesses to the dispute lived closer to New York than Texas (where plaintiff was based). The plaintiff wanted to keep the case in Texas. In support of its motion to transfer, CBS tried to offer into evidence a LinkedIn page of a third-party witness who apparently lived in New York. CBS wanted the page into evidence to support its argument that New York was the more convenient forum for the case. Held: The LinkedIn page was inadmissible hearsay since CBS failed to lay a foundation for the page’s authenticity. CBS’s motion to transfer venue is denied. The basis for the court’s ruling was Evidence Rule 803(17). This rule provides for potential admission of “market quotations, lists, directories, or other compilations” generally relied on by the public or persons in particular occupations. The twin purposes for streamlined admissibility under this rule are reliability and necessity. Necessity exists because most commercial publications have multiple authors so it’s not logistically feasible to have all of them testify to a document’s contents. Reliability lies in the fact that the documents are regularly consulted by third parties and that if the documents weren’t accurate, the public or a given industry would stop consulting them. (*5). To support its argument that key third-party witnesses lived closer to New York than Texas, CBS offered a third-party witness’s LinkedIn page through a CBS employee. CBS labelled the LinkedIn page as “compilation” evidence under Rule 803(17). Testifying about the page, the CBS employee stated he was a journalist and that he regularly used online resources to locate individuals – including the witness whose LinkedIn page was involved in this case. Rejecting CBS’ argument, the court found that the LinkedIn page failed both prongs of the 803(17) admissibility test: “This is clearly not the type of evidence contemplated by FRE 803(17)”, it said. The LinkedIn page wasn’t reliable because CBS offered no evidence to show LinkedIn (the “compiler” under the Rule) makes any effort to verify the accuracy of its member’s profile pages. The court also found that the page wasn’t necessary since CBS could have provided testimony or an affidavit of someone who had actual knowledge of the witness’s/LinkedIn member’s location. Because the page failed both the necessity and reliability prongs of the 803(17) test, the court discredited CBS’ evidence and found that CBS failed to carry its burden of showing it was more convenient to have the case litigated in New York instead of Texas. (*5). 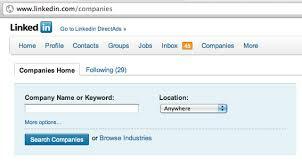 A LinkedIn page or other social media member page can likely be authenticated and admitted into evidence but not as a Rule 803(17) compilation or directory (at least in this District). If documentary evidence that supposedly shows a witness’s location isn’t reliable or necessary, the proponent of the evidence will need to do more than simply offer hearsay evidence through a third-party. Instead, the proponent should try to get the evidence in through live testimony or an affidavit of someone who has first-hand knowledge of a witness’s whereabouts. Post-script: In September 2014, the Federal jury awarded the plaintiff over $1.3M in damages against CBS for infringing the plaintiff’s podcast distribution patent.